IMPCCONSTANTIVSPFAVG [IMP C CONSTANTIVS P F AVG]; head r., laur. SACMONVRBAVGGETCAESSNN [SAC MON VRB AVGG ET CAESS NN]; Moneta stg. l., r. holding scales, l. cornucopiae. RS in exergue. [CORRECTION]. RIC lists for this type only officina S (p. 365). Note, however, that there is an error in RIC and officinae attested for ROMA 121 (P and S) are in fact attested for ROMA 120a. 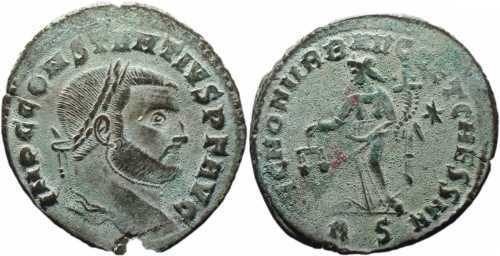 For example, this coin is cited in RIC as ROMA 121, off. S. See CORRIGENDA, VOL. VI, p. 365). Note also that portrait resembles Galerius Maximian and coin could be regarded as an engraver's error (wrong obv. legend) or a hybrid. Weight 8.82 g. From the British Museum Collection (reg. no. B.2041).